Beautiful house (unfurnished) of app. 125m2 with 2 bedrooms and 2 large terraces located in the lively Jordaan area. Entrance, large hallway with wardrobe, separate toilet and bedroom. The storage room of app. 15m2 is situated at the back of the hallway. The boiler, the washingmachine/dryer connection and worktop with integrated sink and faucet are situated in this room. Bedroom with built-in closet, luxury bathroom provided with a bath tub, shower, double sink and floor heating. Hallway with separate toilet and access to the large terrace (16m2). Beautiful, luxurious living kitchen provided with all modern built-in appliances. Tile floor with floor heating in the kitchen, wooden floor in the living area. Bright living room with connection for the wood heater and double opening doors to the second terrace with a sun screen over the whole width of the terrace. The apartment is located in the middle of the Jordaan area with several shops, the ‘Noordermarkt’ , the ‘Haarlemmerstraat’, and a diversity of cafes and restaurants. Excellent elemantary schools are minutes away. 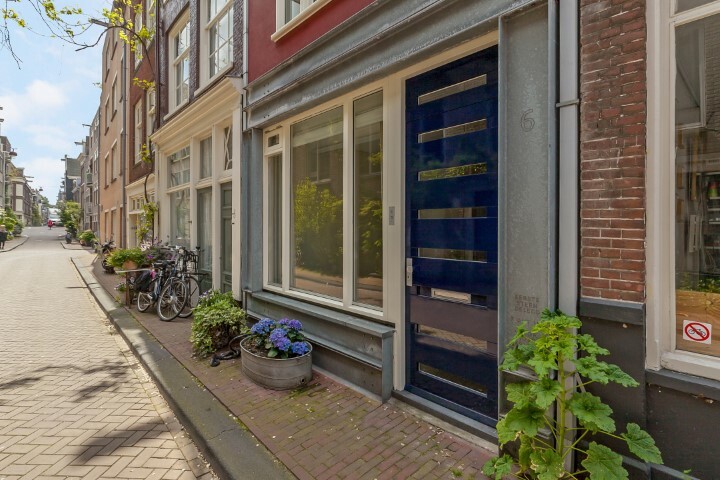 The apartment is situated in a quiet street between Egelantiersgracht and Tuinstraat.